The Rangers press release claimed that a heavy exchange of fire took place during the raid, in which five of the suspected terrorists died on the spot. 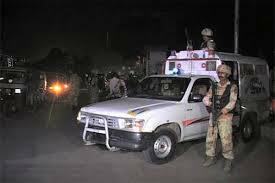 Eight suspected terrorists were killed during an "encounter" jointly carried out by the Rangers and the Counter-Terrorism Department (CTD) in Karachi's Raees Goth area on Saturday night, officials said. Another of the suspected terrorists was identified by the Rangers as Arsalan Baig, a member of the ASP's target-killing team. Sindh Chief Minister Murad Shah had claimed the arrests of high-profile militants in raids at the time, hinting at a "breakthrough". Though the police had neither confirmed nor denied the news reports on TV channels about Hashmi's arrest, SSP Malir Rao Anwar had made a few claims lending strength to the reports of such a “success”. Dawn had also reported that the Al Qaeda-inspired militant group comprising hardly 10 fighters had been busted with almost all its members taken into custody for interrogation. Eight suspected terrorists were killed during an "encounter" jointly carried out by the Rangers and the Counter-Terrorism Department (CTD) in Karachi's Raees Goth area on Saturday night, officials said. A Rangers press release claimed that the operation was carried out on the basis of technical intelligence and evidence after receiving a tip-off about the presence of Ansarul Sharia Pakistan (ASP) terrorists in the area.